Episode 41: "The Super Speedy Cider Squeezy 6000"
Intro: Rainbow Dash rips Fluttershy out of bed to be first in line for cider, only to find that other ponies camped out overnight. Act 1: Cider season opens but the cider runs out early. 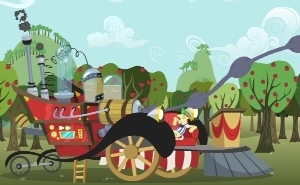 The Flim Flam brothers arrive in their cider machine, offering a partnership but are rebuffed. Act 2: Flim and Flam return the next day after the cider runs out again and challenge the Apples to a contest to see who can make the most cider. The stakes are exclusive rights to sell cider, which will doom Sweet Apple Acres if the Apples lose. Act 3: The Mane Six help out the Apples as honorary family, but Flim and Flam turn off their machine's quality control to get ahead. Flim and Flam win handily, but the town rejects their low-quality brew, allowing the Apples to stay. Character: Warning: I am about to say critical things about a fan-favorite episode written by one of the best MLP authors. Please make sure all glass bottles are empty before throwing them. With the exception of Applejack, the Apple family is in character here, especially impulsive little Apple Bloom. But I am amazed at the bad business sense demonstrated here, both before and during Flim and Flam's visit. If we accept what we see here, I suspect the Apples' virtual monopoly on the town's apple products may have something to do with it. Limiting the number of items per customer would be a good start; I won't even get into the whole supply/demand thing. Further, Applejack is upset at the prospect of having a competing business in town. I won't let economic theory ruin an episode (or an episode review for that matter), but this is basically: "Open up a Target across the street from my Wal-Mart? You wouldn't dare!" (By the way, for those who see a Wal-Mart vs. small family business plot here, the Apple family IS Wal-Mart by Equestrian standards, and Flim and Flam are the small family business.) More to the point, it's out of character for the competitive good sport Applejack to object to the idea of more than one business of the same kind in Ponyville. Mind you, this is before the Flim Flam brothers threatened to drive them out of business, and after they had offered a cooperative venture that may well have been negotiable. The Flim Flam Brothers deserve a second look as well. Their role as villains feels forced, which is highly unusual for MLP, by having them make threatening and gleeful remarks about seizing the farm. But their actual methods aren't objectionable until they turn off their quality control, which seems to have worked just as well as the Apples' methods up to that point. Is it their automation that's made out to be evil, or the mere presence of other apple-sellers? I'm guessing the town didn't realize the true stakes of the contest; that's the only explanation for their reactions. That being the case, the possible outcomes should have been made clear to the crowd from the outset. Of course, the whole venture was incredibly foolish. 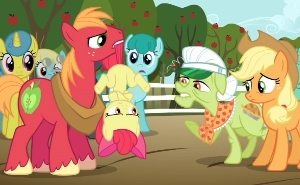 Making it Granny Smith's idea to enter the contest helps to shield Applejack from the blame here, but Granny ought to know better since she's savvy enough in other episodes, and she needs all the positive screen time she can get to offset her frequent use as comic relief. Rainbow's fit over missing out on cider is in keeping with her short-fuse personality. But from what we've seen of Pinkie in recent episodes she's not as self-absorbed as she demonstrates in the first half of this episode. In the early first season I could buy it, but not now. 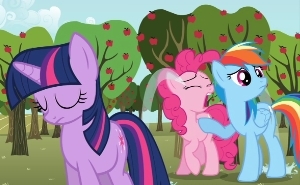 Lesson: My first thought about the lesson, about the time the Apples ran out of cider the first time, was that this show would be about fairness, to wit, finding a way to give all the ponies a reasonable chance for cider. The Flim Flam Brothers would probably have accomplished that, so I was expecting the competition to be resolved by a cooperative joint venture. Probably would have made a good episode. As it stands, this episode is essentially a John Henry story with the end lesson being the importance of quality in one's work. "If you take your time to do things the right way, your work will speak for itself." It's clear from this and several other episodes that the second season has broadened its lessons beyond friendship, a move I disagree with. (It gets better, though.) The support of AJ's friends comes into the letter as an afterthought, but it's nothing new and would only have been remarkable if it were absent. Applejack's letter galls me more than any other flaw in the episode, and in my mind Celestia had AJ rewrite it. 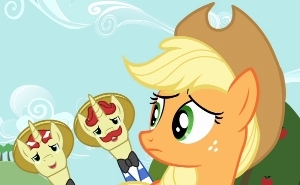 The flippancy of an "I told you so," particularly in a report to royalty, is extremely out of character for Applejack (though perfectly in character for the roguish Mitch Larson), and a bad example to children who may be tempted to try that attitude with teachers. Logic: From the terms of the contest, it seems the town has the power to grant a business exclusive rights to certain activity, much as a US city might do for a cable company. That's not wrong in and of itself (except from a free-market perspective), but it seems a tad out of step with the cutie mark concept: What happens when a Ponyville pony outside the Apple family has apple growing and/or selling as their special talent? Resonance: There are a couple of funny moments: Fluttershy blushing in bed at the beginning, and Pinkie's military-style, "Yes sir, ma'am, sir!" The post-contest scene got me as a tearjerker. Pinkie Pie crying, I mean really crying, is the saddest thing I have ever heard. Speculating on what might have been, I could see The Last Roundup packing a little more punch if it had aired immediately after this episode instead of just before. The events of this episode would have provided an additional possible motive for Applejack to cut her ties to Ponyville, strengthening the misdirection/mystery aspect of that story. There's nothing downright objectionable in this episode, but there are enough out-of-character actions and the messages are so problematic that the flaws heavily outweigh the strengths and distract from the enjoyment the show offers. It's regrettable because Larson otherwise puts out the most consistently high-quality work in the series, and this very episode is about the importance of quality. The song almost pushes this up to a suit of Leather Armor, but not quite.